We've all loved the WallStreet, but sometimes it's a bit slow. With the Allegro 500 processor upgrade, you can speed it up. "We've read all the horror stories about other upgrades from the usual suspects. The ROM dies, and then you spend 4 months waiting on a replacement. Or the installation process gets stuck, and you spend an hour on the phone with tech support, trying to get help, then you get to return it! No fun! "So we decided we would build a better upgrade. How do we get around it?? We use upgraded processors which DO NOT require installation of ROM, drivers, or upgrade software! "We guarantee your installation is 100% compatible with all WallStreet software and hardware. Just pull the old processor, slide ours in, and you'll be running again in just 3-5 minutes! There is NO software required, no other installation necessary beyond plugging in your new card. "Why not G4? Good question. But think about it. The only real advantage of G4 is the AltiVec processor, which is rarely utilized, except for video processing. And the WallStreet is really not set up for video processing anyway, so if you were going to do video, you'd save that extra $150, and get a Pismo. So our opinion is, get the Allegro, save your pennies, and get on with life! "The bottom line is, will this thing function? The answer is yes! We have been able to reduce processor heat by nearly 50% cooler than even the G3 PowerBook Pismo! Our processor operates at a balmy 55C (that's 131F for you Americans!). And cool is good - this means great reliability for your processor, and excellent performance for you." The Allegro will accept more RAM - up to 512 MB. The PowerBook Medic online store is now open, accepting major credit cards, checks, and PayPal. All transactions are secure with SSL encryption. 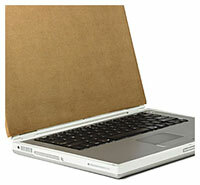 PowerBook Medic offers replacement parts, take-apart manuals, and PowerBook upgrades. PowerBook Medic also offers services including installations, repairs, manuals, and parts. The fee for installations and repairs is a flat $65. This is a detailed take apart guide for the Apple iBook White Ice. This manual includes detailed pictures and explanations of take apart procedures. After buying this item, you will automatically be able to download the manual. This is a replacement set of four new feet for the PowerBook Pismo / Lombard. The feet need to be applied with super glue. This is a complete set of screws for the G3 Pismo. This is a Torx T8 screwdriver to remove the screws from your PowerBook or iBook. Andrei Raevsky has set up Laptops for Teens, a program to provide laptops to poorer kids. You donate him your old laptop. At a minimum it must have Pentium or AMD (or compatible) processor, 64 MB of RAM memory, a 500 MB hard drive, and a CD-ROM. The laptop does not need to be in top condition; its screen or case could have a bump or two and its keyboard could be in poor shape. Once Linux is installed on the laptop, Andrei will donate it to an underprivileged teenager (selected by local high schools or the police department). He will also teach the teen how to use it at no charge. All this will be free of any charge. The combination of a laptop and the skills needed to run Linux on it will give this teenager the ability not only to use a word-processor or a spreadsheet, but also surf the Internet, send and receive emails, and much more. In fact, he/she will have all the tools to become a computer programmer or system administrator. Andrei is a Swiss citizen and a certified Windows programmer and Linux system administrator living in Florida. This is a very commendable project, and if you have or know of any surplus PC laptops, get in touch with Andrei. Maybe we could even convince him to include Mac laptops (which can run Linux as well) in the program. The soft PortaBrace case has a large inside pocket and roomy outside flap compartment, lots of room for file folders, scripts, proposals, note pad, and all the rest of the paper you can't avoid carrying. Several large outside slip pockets, one with zipper for extra security, keep clipboard or notebook ready at hand and smaller slip pockets for whatever you need a place for at the moment. Would your life be easier if you could take your desktop computer to the job site instead of the job site coming to you? Magma's 2 Slot CardBus-to-PCI Expansion System is just what you need to make this idea a reality. This expansion system adds two full-length 32-bit or 64-bit PCI slots to PowerBooks and PC Laptops. Now you can get rid of that unmovable desktop computer and use a portable computer instead. All this potential is available in a box with a similar footprint to the variety of portable computers on the market today. No more bulky "lunchbox" computers are required. Now you can use your favorite laptop computer in the same capacity as a full-size desktop machine. The two slot expansion system is available in several different configurations. One of the most popular solutions is Model CB2, which accommodates 2 full-length 32-bit PCI cards and has a drive bay esspecially designed so you can add an internal SCSI, FireWire, or IDE/ATA drive. That's right - the same drive that you use with a desktop computer. Now there's no reason to run out of disk space! The newest addition of the 2 slot expansion line is Model CB264, which accommodates 2 full-length 64-bit PCI cards. Although communication to the computer will be in 32-bit mode, communication inside the expansion system can be in 64-bit mode. As an added bonus, users who require true "go anywhere" portability, Magma offers the 2 Slot CardBus-to-PCI Expansion System in a DC-ready format. Magma's DC Models are made to be powered on any user supplied 12-volt DC power source (such as a battery or car lighter adapter.) DC Models have an XLR-4 power connector and are shipped with a 100-Watt AC power brick, for those occasions when AC power is available. The most unique feature of the 2 slot expansion system is the ability to add a SCSI, FireWire, or IDE/ATA drive without using one of the two available PCI slots. There is a special third PCI slot available to install one of Magma's SCSI, FireWire, or IDE/ATA Storage Kits. By purchasing a Storage Kit you increase the flexibility and functionality of the 2 slot expansion system. Two fully usable PCI slots are still available for your other PCI cards. Six different Storage Kits are available. Higher Ground is a line of highly functional laptop cases from Shaun Jackson Design that offer full time protection for your notebook computer and open to create a comfortable work environment for use on your lap or desktop surface. Models range from compact sleeves to backpacks. 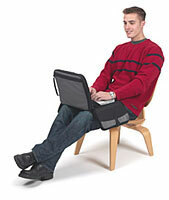 Laptrap is a unique, padded sleeve for your computer that unfolds in seconds for use on your lap or desk. The Laptrap is a solution for users who want the protection of a compact, dedicated laptop case with the added functionality of a portable office, but do not want to give up their current briefcase, bag, or backpack. The clever design of this unique computer carrying case, allows you to convert it in seconds from a comfortable, padded backpack to a single shoulder strap vertical briefcase. The pack opens to create a functional, well organized portable office, for use on your lap or on any desk top. Two great products in one! 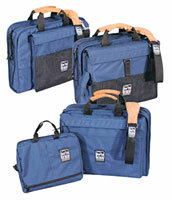 A well padded laptop case combined with a 3-ring binder and organizer. This versatile product allows you to use your laptop without removing it from the case. It's small footprint and non slip surfaces keep your computer safe and secure on your lap or a small desktop. Lexar Media, Inc. announces JumpDrive Secure, a rugged portable USB storage device with security software. JumpDrive Secure is made from impact resistant ABS plastic and co-molded rubber for extreme durability. The device also includes encrypted password protected security software for PC and Mac to protect data from unauthorized access. With these features, JumpDrive Secure ensures that data will be available wherever and whenever it is needed and is kept safe from unauthorized users. The JumpDrive Secure security software allows users to designate a secure area on the drive to store files, and incorporates password-protected access for the user. This allows the primary user to share some, but not all, of the information on the JumpDrive. Formatting of the secure area is only permitted with password access to protect against unauthorized deletion. The software offers cross platform support for Windows and Macintosh computers and true data portability between platforms. Most important for people using multiple computers, the security software is resident on the JumpDrive, which allows authorized users to access the secure area of the drive from any computer with the software available on the JumpDrive. This offers an advantage over other solutions that require users to download their security software from the Web or a CD to install it on each computer used. "All our JumpDrive products offer the benefit of keeping your important data with you at all times. Now, the extra rugged JumpDrive Secure is more protected from everyday wear and tear. The security software also ensures data will be available when it is needed and is protected against unauthorized users," said David Klenske, director of product marketing, Lexar Media. JumpDrive Secure features a unique software interface that is intuitive and easy to use. It is also the only USB flash storage device on the market to include security software especially for Mac users, complete with an Aqua interface. The security software will work with Windows 2000, XP, and Mac OS X. "Removable USB flash storage has established itself as a major player in the flash memory card market over the past two years," said Alan Niebel, CEO, Web-Feet Research. "In 2002, 4.4 million units were sold and for 2003 we expect to see over 11.3 million units sold, generating at least $360 million in revenue." JumpDrive Secure is the fourth JumpDrive introduced by Lexar Media. With the addition of JumpDrive Secure, the JumpDrive product line addresses the needs of a range of customers, including value pricing, high-speed data transfer, interchangeable and expandable memory, and now security. Lexar Media has the broadest offering of any USB flash drive manufacturer. JumpDrive Secure will be available in retail outlets in March and will be available in 64 MB, 128 MB, and 256 MB capacities. Suggested retail pricing for the product is $59.99, $89.99, and $149.99, respectively. The drive requires no drivers for modern operating systems including Windows 2000, ME, XP, and Mac OS X.
Acme Made Inc. has introduced two new designs for the Apple G4 PowerBooks, the PowerBook "iCover" and a sleek new carrying case called "The Slim." The PowerBook iCover is a thin sleeve designed to easily slip over the PowerBook's display and protect it from indentations the keyboard leaves when the unit is closed. The iCover is constructed from a synthetic micro-suede that is very durable, washable, and looks great. It retails on the Acme Made site for $19.99 and comes in 12", 15", and 17" sizes. 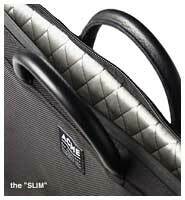 The "Slim" is Acme Made's new hybrid sleeve/carrying case designed specifically for Apple's new PowerBooks, but also fits Apple's 12" iBook and the small models of the Sony Vaio. The thinly designed Slim easily fits within a larger bag or, using its detachable strap, carried on its own as a lightweight travel case. Geared towards a more discerning audience, the $85 Slim combines hi-tech materials - such as rubberized, splash-proof zippers, high density foam, and ballistic nylon - with traditional leather handles and a stylish quilted satin lining. "We wanted to do something a little different that looks and functions a little better than your typical computer bag," says Acme Made's Mark Loncar. Additionally, the "Designer" Slims are limited editions featuring textiles by such notable architect/designers as Charles and Ray Eames and Verner Panton. WiebeTech announces a higher performance version of the popular MicroGB+ FireWire pocket drive featuring a 40 GB notebook drive with a 5400 RPM spindle and a 16 MB cache. Also, a higher performance version of the DesktopGB+ is introduced. In addition, WiebeTech offers a free miniature radio-controlled car for all end user orders placed directly through WiebeTech's online store at www.wiebetech.com with an order value of $300 or more. The car has a value of $29.95. Supplies are limited. The new version of the MicroGB+ features a 40 GB notebook drive with a 5400 RPM spindle and a 16 MB cache. The resulting real world performance of MicroGB+ in this new configuration has been measured at approximately 25 MB/sec on a 1 GB file transfer test. This gives users increased performance for demanding applications such as Apple' Final Cut Pro or DigiDesign's ProTools audio editing application. The new version of the DesktopGB+ incorporates an extremely quiet Hitachi fluid bearing 120 GB drive with an increased 8 MB cache. The increased cache size offers a higher level of performance for users. The RC Car is free with any $300 order placed online only. In the U.S. and Canada, dealers may purchase any configuration of MicroGB+ or DesktoGB+ from WiebeTech's distributor, Dr Bott LLC, or from dealers. All configurations are in stock and available directly from WiebeTech. Canadian resellers may purchase products from EMJ.